Christmas Magic Celebration — Win Free Books For A Year! Five Christmas Magic winners will each receive Free Books For A Year — Five winners, one e-book a month, 12 books each for 2018 from ChangelingPress.com. Two Christmas Magic winners will receive one book a week all year — Two winners, 52 e-books each, for 2018 from ChangelingPress.com. The best part — all you have to do is buy any Christmas themed book at ChangelingPress.com between November 24th and December 31st, 2017, and you’re automatically entered to win. 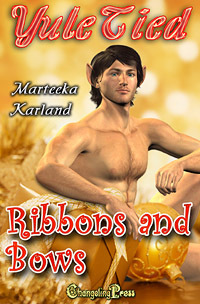 It may take more than ribbons and bows to tie Jerrica to his side but Samson’s up for the challenge. ‹ Terras Five, book two – Taming the Cyborg by Anne Kane	› Kaeden and his band of mercenaries will do whatever it takes to keep the women they love safe!